We offer a wide range of High Performance Diesel Overflow Valves, which are extensively used by automotive industries all over the world. 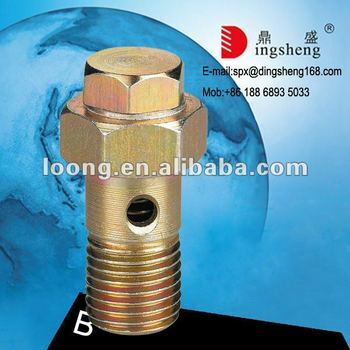 These valves are tested to ensure their capability of handling the pressure in extreme working conditions. Our valves are in compliance with international standards and available in customized sizes and finishes to suit customers' demands. The overflow valve is located on the side of the injection pump (Fig. 58). It is also used to connect the fuel return line (banjo fitting) to the fuel injection pump. This overflow valve regulates the primary pressure inside the injection pump. If this pressure is not within standards it can effect your timing, injector function and a number of other factors. This can cause your engine to run poorly in many ways. Low RPM stumble, low power, excess smoke, hard starting, poor fuel mileage. Check your fuel pressure. It should be around 20psi at idle and rise to around 27psi when you rev it up without a load. This overflow valve is the new style with the ball type spring retainer, not the old double bolt head type. Be sure to check for other fuel flow restrictions, such as plugged primary filter (screen under your fuel heater), fuel filter, fuel lines etc.